Udaipur World Music Festival 2018 - 365 Festivals :: Everyday is a Festival! Udaipur is one of the favorite tourist spots in the entire Rajasthan. But do you know that this place is famous for one more thing other than its exotic forts and lakes? And it is nothing but its music. Both folk and fusion music is its specialty. And the golden addition to it is Udaipur World Music Festival. Some of the well-known voices heard at this event. If you are planning any vacation of Udaipur, it is the perfect time of the year. One of famous music fest celebrated in the nation, ranks the Udaipur World Music Festival in the topmost section of its list. Nearly hundreds of music lover gather at one spot as the fest hits its commencement date. The fest set to enthralls its audience in February mostly on the second weekend every year. Not just national but artist arrives from over 16 nations to rock the stage in the city of lakes. Moreover, it runs for three days straight up to twelve hours each day. As the 2018 February just begun ringing the bell of this fest return. The fest starts off this year on 9th of Feb and will continue to 11th of Feb. The show will break ground at 11 am and go till 11 pm. 2016 was the year which laid the foundation for this fest. All kudos to Sanjeev Bhargava who conceptualize it and SEHER who produced it. Then after the cultural event organization, SEHER keeps on organizing it every year. Undoubtedly, it is an acknowledgment of the rich cultural background of Udaipur. 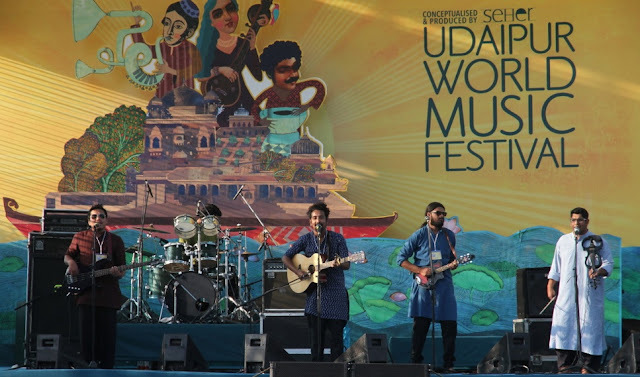 The first ever Udaipur World Music Festival was itself a huge success where it has performances from many top artists coming from 12 nations. Some of the notable performances it received till now include Grammy-award-winning singer Dobet Gnahoré, Rajasthani vocalist Mukhtiyar Ali, French composer Mathias Duplessy and the Raghu Dixit Project. When is Udaipur World Music Festival celebrated? The new season of the fest which will run on 9 to 11th Feb held at Gandhi Ground and Fateh Sagar Pal. Arrival of this fest give one more reason to boost its tourism. Undoubtedly, its popularity is rising at a high pace which is quite evident to its attendees counting. Numerous artists who sum up to at least 150 belonging to 16 nations set to make the audience go weak on their knees. What do people do on Udaipur World Music Festival? Well, it is just the third season of the fest, but it appears that it is quite popular inside and outside the nation. Many people plan a trip to Udaipur to witness the magical days of the fest. It serves nearly every music genre. Some of them include Sufi, Jazz, Indi pop, electro and some other on the list. If you were planning to give it a visit, you should see collet all the information regarding it. Of course, it includes the traveling details of its venue. For booking your ticket, the official website offers the service for booking online. Moreover, Udaipur is not hard to reach because of its connectivity from all routes. That means you can choose either between railways, roadways, and airways. The airways are the most convenient route as Udaipur has its airport. In case you want to reach here by roads, then national highways eight from Delhi will be the straightforward way. Similarly, railways also offer a solution to arrive here. The official lineups released has names like NoJazz, Shubh Saran & Band, Bipul Chettri, Shankar Ehsaan Loy, Flavia Coelho, and Txarango.